One of my favorite meals growing up was my mom's pot of Stuffed Peppers. We would spend Sunday afternoons hollowing out green bell peppers, stuffing each with a mixture of ground beef and rice, then simmering the stuffed to the brim peppers in a large pot with tomato soup until softened. This gluten-free soup is a deconstructed version Stuffed Peppers. It includes all the savory flavors of stuffed peppers, but in a different form. Each spoonful of this soup taste like biting into a stuffed pepper, except not nearly as messy and ready in half the time. Instead of stuffing green bell peppers, lean ground beef or turkey is browned in a pot of softened onions and garlic. 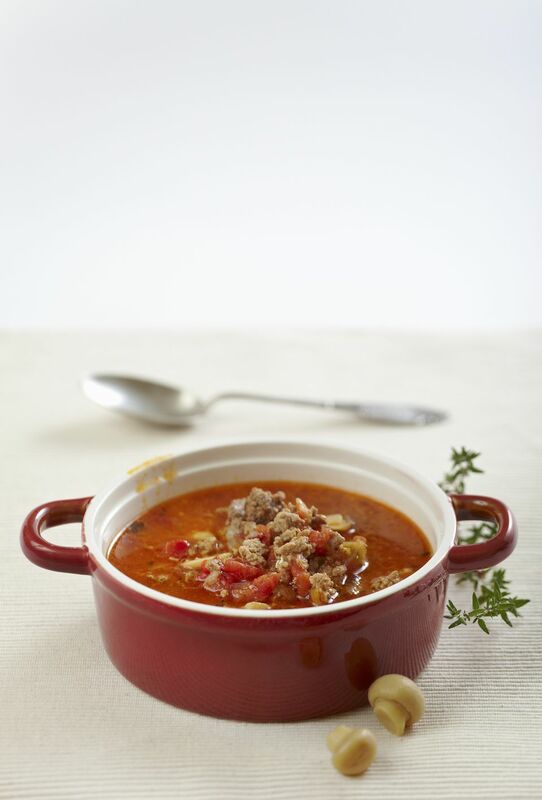 Gluten-free tomato soup and beef broth are added to the pot followed by chopped green bell peppers, all the ingredients simmered together until softened and the flavors come together. In place of lean ground beef, you can use lean ground turkey instead. Many soups use wheat-based ingredients as thickeners, so when purchasing creamy tomato soup or both, be sure to check the labels to confirm they are gluten-free (Pacific Foods is my go-to brands for quality, delicious, gluten-free soups). Garnish the bowls of soup with grated Parmesan, if desired, and serve with a hearty slice of gluten-free bread. Cook long grain brown rice according to package directions. Set aside. While rice is cooking, heat extra virgin olive oil in a medium stock pot over medium-high heat. Once oil is shimmering, add chopped onion and cook until translucent, about 3 minutes. Add garlic and cook until fragrant, about 1 minute. Add ground turkey to the pot, breaking up the meat with a wooden spoon. Season with salt and pepper, to taste. Add gluten-free tomato soup and gluten-free beef broth to the pot, stirring to combine. Bring soup to a light boil, then simmer on low heat for 10 minutes. Add chopped green bell pepper and simmer for an additional 5 minutes. Distribute the soup into 4-6 bowls followed by desired amount of rice. Top with Parmesan cheese, if desired. Serve immediately.